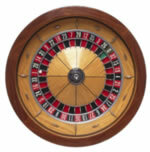 Close to 300 years old there are lots of theories as to the invention of Roulette. One theory states that a French monk created it to relieve the boredom of a monastic life. The more commonly accepted theory is that roulette was invented by a French man named Blaise Pascal around 1657. A mathematician by trade his fascination and experimentation with perpetual motion led him to create the first "little wheel" which is the French term for Roulette. However the very first recorded account of a spinning ball rotating a wheel in the style of Roulette was not until around 1720 in England under the name roly-poly, yep you read it rght roly-poly :-). The Gaming Acts of 1739 and 1740 banned roly-poly over gambling and wagering disputes, but was craftily re-introduced by a man named Beau Nash under the guise of "EO." EO, or even-odd. This was a simpler version of the game but was also outlawed in 1745. It was not until around the year 1842 that the roulette we all recognise today was introduced and established by two brothers Francois and Louis Blanc who were the first to introduce the single zero to increase house odds. Then upon arrival in America there was a second amendment where a double zero was added again to increase house odds. Using a single zero increased the house odds by about 2.7% on a European Roulette wheel and around 5.3% on a double zero American style wheel. An old legend tells about Franois Blanc, who supposedly bargained with the devil to obtain the secrets of roulette. The legend is based on the fact that if you add up all the numbers on the roulette wheel (from 1 to 36), the resulting total is "666", which is the "Number of the Beast" and represents the devil - ooo scary! During the 18th Century Prince Charles of Monaco persuaded Louis Blanc to bring his now famous Roulette wheel over to Monaco to build and introduce gambling to the Principality to alleviate the financial problems of the tiny state. He reportedly paid 2 million Francs to build Monte Carlo casino and thus cementing Monte Carlo as the home of European gambling glitz and glamour, and set the standards of casinos around the world that we appreciate until this very day. Meanwhile America went crazy for the roulette wheel and gambling in general especially around the time of the great gold rush in the 19th century right up until World War II. After the war Roulette was not such a big deal and people became fascinated with the notion that Blackjack was beatable due to Edward O' Thorpe introducing his theories on basic strategy in 1963. which brings us pretty much up to the modern day where we have Roulette, casinos and gambling galore where we can bet on pretty much anything. More notably with the invention of the internet, which has led to a massive explosion in online gambling and online casinos over the last 10 - 15 years. Who knows what will be next for the world of gambling?